The French national anthem - La Marseillaise - will be played before all of this weekend's Premier League matches. Premier League chief Richard Scudamore said it was an act of "solidarity and remembrance" after the Paris attacks, in which 130 people died. Fans had united to sing La Marseillaise before England's win over France at Wembley on Tuesday. There are 72 French footballers who play in the Premier League. "Given how close we are, as well as the long-standing relationship that exists between the Premier League and France, playing La Marseillaise as an act of solidarity and remembrance is the right thing to do," said Scudamore. 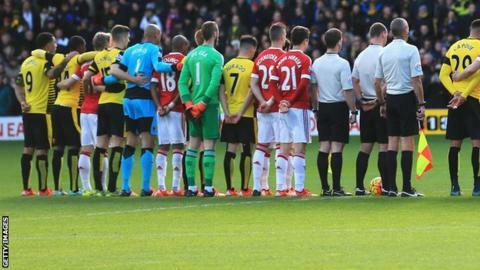 Watford and Manchester United each had a French player in their starting line-up - Etienne Capoue for the former and Morgan Schneiderlin for the latter - and both sang their nation's anthem prior to the lunchtime kick-off on Saturday. Chelsea's players wore black armbands incorporating the French flag during their home game with Norwich City on Saturday. Newcastle United's players also wore black armbands during their home match with Leicester City. The Premier League has briefed each club on the current threat alert and existing security guidance.